"This rich tasting dish is amazingly quick and easy." In a large bowl combine the seasoning packet from the stuffing mix with the hot water and butter. Let stand until butter melts. Stir in the stuffing crumbs, just to moisten, and let stand for 5 minutes. Place the chicken down the center of a 8x12 inch baking dish. Mix together the soup and milk and pour mixture over the chicken. 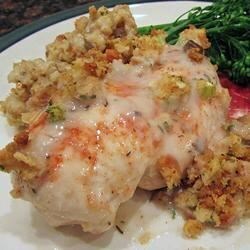 Spoon some of the stuffing over the chicken breasts, then spoon the rest along the sides of the chicken. Bake in the preheated oven for 35 minutes or until the chicken is fully cooked and the juices run clear. This recipe turned out great! Very moist and flavorful. It was very quick and easy to put together. Definitely a keeper for me. Excellent! My whole family loved this. I used cream of celery instead of cream of mushroom...still excellent.